Life with Aspergers: Book Review: “The Parents’ Guide to Teaching Kids with Asperger Syndrome and other ASDs Real-Life Skill for Independence” by Patrica Romanowski Sashe MSED, BCBA. 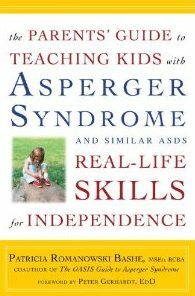 Book Review: “The Parents’ Guide to Teaching Kids with Asperger Syndrome and other ASDs Real-Life Skill for Independence” by Patrica Romanowski Sashe MSED, BCBA. I was really looking forward to this book by the co-author of the excellent “Oasis Guide to Aspergers Syndrome”. While there’s a lot of general information out there on Aspergers Syndrome there isn’t so much on adaptations for specific life skills. I was hopeful that this book would fill the gap. I guess the best way to describe the book is like one of the better roller coasters at a theme park. It’s got a great name which shows a lot of promise, so everyone lines up. You face a seemingly interminable wait to get to the coaster but when you finally get on you go “wow... this was really worthwhile”. Then it abruptly ends making you wish that there was more. The book is 330 pages long, not including the index, templates and notes sections. The first 140 pages contains a description of Aspergers syndrome and associated conditions. It’s full of statistics and quotes and I’m sure that it’s very good information but it’s not what the book is supposed to be about. At about chapter eight, Patricia starts to get into various teaching methods and the book gets a little more on topic as a result. The following chapters discuss school matters and how parents can be effective teachers. Again, good stuff but still not quite on topic. On page 251, the book does an abrupt about-face and hits gold. It finally gets on topic and does a really fantastic job. This is the bit where you actually get to ride the roller coaster. Unfortunately, this particular roller coaster is a mere 90 pages long and it’s over all too soon. I don't think it matters though because this section alone is worth buying the book for. In the “gold” pages, Patricia talks about clothes; getting dressed, recognising soiled clothes and getting rid of old favourites.There are sections on tying shoes, testing new textures and creating "your own style". The other gold sections are on personal care and hygiene, helping around the house, getting ready for school and doing homework. This section ends with a discussion of the play skills and how to develop them. This book takes a long time to get to the real subject matter but when it finally does, it’s brilliant. If you’re already well versed in aspergers syndrome, you might be best off starting on page 251 but if you’re new to it, the information in the first couple of parts is accurate and informative. It’s easily the best book I’ve read so far on teaching real life skills to kids with Aspergers syndrome - and I’ve read quite a few on this topic. “The Parents’ Guide to Teaching Kids with Asperger Syndrome and other ASDs Real-Life Skill for Independence” by Patrica Romanowski Sashe MSED, BCBA is available on amazon and other good bookstores. Honesty clause: I was provided with a review copy of this book at no charge. Is there an age group that this is geared for? Like for teaching small children or older kids? The book doesn't mention specific ages but it seems to cover quite a wide age group. For example, the personal development section covers toileting (late toileting I think) until menstruation. Thanks. I have a 9 year old with Aspergers and he couldn't care less about hygiene. Maybe this could help. He tells me "It's my body and I will keep it in the condition that I want to." Ha! Not if I have anything to say about it.